Today we celebrate Cesar Chavez Day and remember the challenges faced and battles fought by farm workers across the country. It’s also a time to discuss the fight that lives on today in the U.S. and abroad – a fight for fair wages and safe working conditions in an industry supported by a population of laborers whose rights are often difficult to protect. In North America, most farm workers come from Latin America. 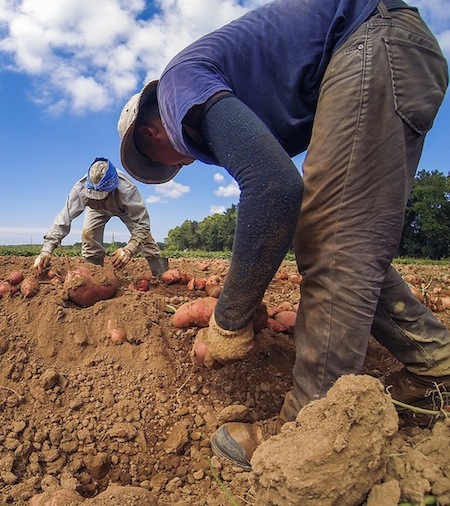 The U.S. Department of Labor says that close to 90 percent of farm workers are Spanish-speakers, and more than half of immigrant farm workers nationwide do not have legal protection. More indigenous workers from rural Mexico and Central America are arriving, as well as guest workers from Asia. Although they pay payroll taxes and contribute anywhere from $6 billion to $7 billion in Social Security funds, migrant farm workers do not come to the United States to get welfare because of the simple fact that they are not eligible. What this tells us is that the realities of agricultural labor in the U.S. are not confined within its borders. Whether it’s a coffee farm in Brazil, a pineapple farm in Costa Rica or an apple farm in North America, farm workers can often find themselves a part of a globally marginalized, transient and largely invisible workforce that brings us our food each day. Just as the issues in our global food systems cannot be addressed by problem-solving in one region alone, restoring pride and dignity to the American farm worker requires a far more global perspective and approach. It requires the equitable appreciation of all farm workers, wherever they may be. Their skills, dedication and sweat are all human. Let’s take the case of Angela Mayor and her husband Pedro Peren, who own a small strawberry farm in Central America. Unfortunately, there is not enough work to support the whole family, which is why their son, Edmer Aroldo Peren, must leave home to find work. As the son of farmers, his skills best lend themselves to agricultural work, so he decides to travel to North America for harvest season each year. Once there, a whole new wave of challenges can arise. He may find himself working with harmful agrochemicals, earning extremely low wages and laboring around the clock with no access to health care. A recent article by Aviva Shen points to a survey of farm workers in New Mexico, where managers threatened to fire workers if they refused to work in direct contact with dangerous, carcinogenic pesticides. These challenges, which are shared by many farm workers across the globe, beg the question: How can we get quality food in a manner that upholds human dignity and enables sustainable livelihoods? One solution could be expanding the scope of existing models, like Fair Trade, for example. Fair Trade is a well-established and proven approach to supporting farmers and workers. It’s also an important way for consumers to identify products that were grown with care. Historically, Fair Trade certification has only been available to farms in the developing world, meaning that a majority of the products in North American grocery stores (and the people behind them) have been outside its scope. According to the USDA, more than 80 percent of food consumed in the U.S. is produced domestically. Given the positive work the Fair Trade movement has been pursuing for decades in the developing world, it could also be very beneficial if applied in the global North. Any farms that earn Fair Trade certification, wherever they may be, must meet and adhere to stringent social and environmental standards. These include: safe working conditions, regulated chemical use, restrictions on work hours, equal opportunity employment, freedom of association and recruitment best practices. They also earn community development premiums to invest in important projects like housing, education and health care. It’s also possible that skills built on Fair Trade farms in the North will benefit workers when they return home, potentially creating new economic and leadership opportunities in both places. Fair Trade USA is an example of one group that is working to apply this proven model to more farmers and workers. Due to their decades of experience, the group knows that farm work remains among the most dangerous and lowest paying occupations anywhere in the world, not just in the global South. This is why they’ve begun a partnership with a progressive farm in Canada, to learn everything they can about what Fair Trade might mean for more than 100 farm workers, most of whom migrate from Central America on a temporary work visa, and their families back home. Through the farm’s compliance with the Fair Trade standards, consumers will know how, where and by whom their food was produced. And as for Edmer Aroldo Peren, the worker I mentioned previously whose parents own a strawberry farm, he was recently elected as the president of the Fair Trade committee, and will vote on how to use the first Fair Trade premiums to address the most pressing needs of the workers, their families and their communities. With this innovation, Fair Trade USA is taking their existing standard, which has been in development and improved upon for decades, and making it more inclusive. They also want to create more opportunities for people to choose Fair Trade more often and enable retailers to sell Fair Trade produce throughout the year (without being limited by seasonality). These products would add to the still-growing Fair Trade market – with more than 12,000 products now in over 150,000 retail locations. By having a predictable, safe and inclusive supply chain, everybody wins. And Avina, a Latin American foundation I represent, is proud to support Fair Trade USA’s progressive and leading role in shaping Fair Trade globally, this Cesar Chavez Day and beyond. Daniel Gonzales directs Avina’s international strategy and team for Migrations.